EMD F40PH 115 -- 766062-16 11/77; "Village of Oaklawn"
116 -- 766062-17 11/77; "Village of Orland Park"
EMD GP30 522-558 -- 27355-27391 6-8/62; high short hoods. 559-565 -- 27978, 27393-27398 6-8/62; high short hoods. 1007-1016 -- 3400-1 to 10 1/65; high-short hoods. Alco C630 1130-1134 -- 3456-01 to 05 5/66; high short hoods; 1135 has been preserved. 1135-1139 -- 3480-01 to 05 9/67; high short hoods; 1135 has been preserved. GE U25B 3515 -- 35581 2/65; replacement for wrecked former Wabash U25B. 9700-9702 -- RP-G4 Slug Built from U30B's. 1201-1212 1201-1212 EMD SW1200 . 2115 801 EMD SW8 . 2290-2296 1509-1515 EMD SW1500 . 2961-2966 2301-2306 EMD SD39 . 3401-3406 1501-1506 EMD GP7 . EMD NW2 2011-2022 -- 11-22 EMD NW2 . 2046-2061, 2065-2083 -- 46-61, 65-83 Alco S-4 . 2085 -- 85 Alco S-1 . 2105, 2106 -- 105, 106 EMD SW1 . 2107-2114 -- 107-114 EMD SW8 . 2134-2155 -- 134-155 FM H12-44 . 2230-2232 -- 230-232 EMD SW7 . 2233-2244 -- 233-244 EMD SW9 . 2325-2333 250-258 325-333 Alco RSD12 . 2448-2524 -- 448-524 EMD GP9 . 2525-2534 1455-1464 525-534 EMD GP9 . 2535-2557 -- 535-557 Alco RS-3 . 2558-2577 -- 558-577 Alco RS11 . 2578 -- 578 Alco C420 . 2700-2709 1490-1499 700-709 EMD GP18 . 2800-2814 1470-1484 800-814 EMD GP9 . 2850-2864 -- 850-864 Alco RS11 . 2865-2875 -- 865-875 Alco RS36 . 50-71 50-71 FM H20-44 . 90-93 (2nd) 90-93 FM H16-44 . 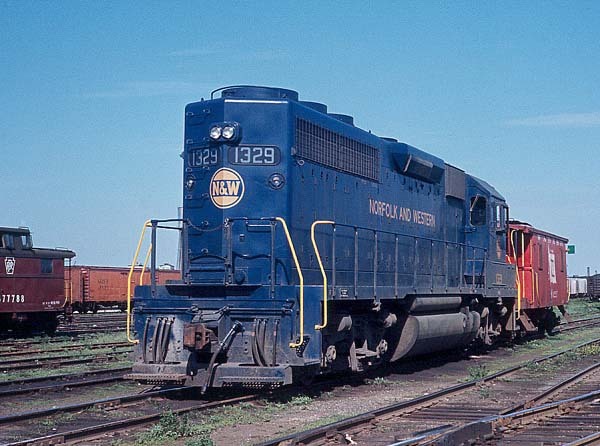 1300, 1301 (70, 71) EMD GP35 Ordered by P&WV, delivered as N&W units.